If game design is an academic subject—and, let’s stop kidding ourselves: it isn’t—then John Raptis and Terry Cavanagh are this season’s Newton and Leibniz. Both recently released platform games (Raptis’s Hoggy and Cavanagh’s VVVVVV) centered around one single mechanic: instead of being able to jump, you have the ability to flip gravity, sending your protagonist from the floor to the ceiling or vice-versa. But while their central concept is the same, the two games really couldn’t be more different in execution. As you'll note in this level, Hoggy's gravity-flipping doesn't affect enemies or other objects. Hoggy, released a few months ago for the iPhone and iPod Touch, is very much a puzzle-platformer, and you guys know how I feel about puzzle-platformers (hint: I love them). The game comprises some 45 levels, which are accessed by jumping into jars scattered throughout a cavernous overworld, much like more recent Mario games. 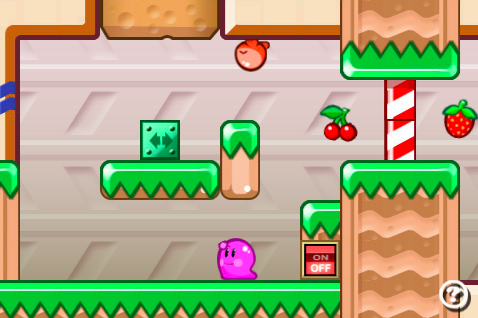 Each level holds some number of fruit, and the eponymous hero’s goal is to eat all of them. The gameplay leans much more heavily towards puzzles rather than action. Hoggy moves left and right when you tilt the device, so Raptis kindly refrains from throwing too many timing- and precision-oriented challenges at you. In particular, the protagonist will refuse to ever jump off of an edge. Sometimes this is helpful, but often it forces you to take more circuitous routes via gravity-flipping. The game also boasts a truly excellent final boss. I’m picky about my bosses, but this one was just great. Multiple stages, each testing different skills you developed along the way, with nothing gimicky thrown in at the last minute. I like my bosses to be sort of a “best-of” overview of the game I just played, and this one certainly qualifies. The game is fairly short—you’ll beat it in a few hours, and probably not have much reason to play again once you’ve beaten all the levels—but for $2.99 (right now, anyway; as with all iPhone apps, the price fluctuates often) it’s hard to complain. You have no idea how hard it was to make this screenshot. 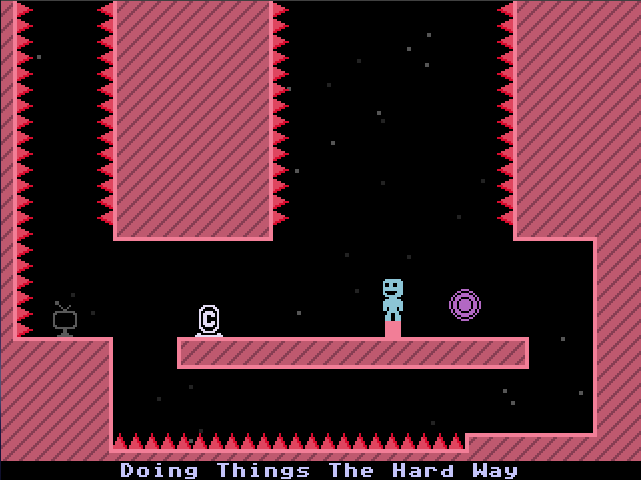 VVVVVV (Windows, Mac, and soon Linux; $15), by contrast, is an entirely different beast. There are maybe two areas in the game that I could seriously refer to as “puzzles”, but the rest, hoo boy. We’re talking old school, ultra-sadistic game design here. If you’ve played Cavanagh’s Don’t Look Back, you know he’s a fan of frequent checkpoints and even more frequent deaths, but VVVVVV just takes it to a whole new level. My first time playing through, I finished in an hour and a half and died six hundred times (apparently this is pretty good), so on average I was killed every nine seconds. It’s a game that revels in its cruelty, and the room names (a wonderful touch that I was constantly forgetting to look at, as I was so engrossed in trying not to die again) provide a nice commentary on the suffering you’re sure to endure throughout. As I said above, it’s a reasonably short game, but there’s much to do once you’ve finished. Aside from time trials and other hard modes (including the hilariously impossible beat-the-game-without-ever-dying challenge), there’s an assortment of trophies to unlock and a minigame to play, both of which you’ll learn about after you do… something. But even without those bonus features, VVVVVV is one of those rare games that you want to play again, just because. I’d never been one for speed runs, but I’m already hooked on playing this repeatedly to improve my time and death count. It’s bizarre to find a game that’s so fun to play yet so cruel to the player, yet Cavanagh has done it. Anyway. Buy Hoggy. Buy VVVVVV. Support independent game developers. Game Review: Dangerous High School Girls in Trouble!